Last edited by TWC_Sp00k; Apr-19-2019 at 06:37. I have a 200mm extension on a T-50 base using my Warthog grip. Also have Crosswind pedals. Using the extension has been like the difference between night and day. I get much more precision sim control movements which, combined with the precision of the pedals, allows me to get sights on very accurately. No bobbing around trying to hold the sights on the target. Needless to say it makes more precise the movements at slow speeds around the landing flare where before I might overcorrect and botch it. I've also noticed in videos by others that pulling the trigger sometimes pulls their sights off target, probably because the slight pull on the stick creates too much sim control movement. I would never go back to a short stick. Thank you all for your very interesting replies / suggestions. So it seems that about 1/3 of y'all are using elongated joysticks. I thought best way for me to judge would be if I'd give it a try just to see the difference. So I zip-tied a piece of wooden stick to my T16000M, I remapped the keys I had on the handle to the keyboard (obviously there are no buttons on my test extension), I placed the device on the floor, and went up for a few test flights. True, the first few minutes were sort of confusing, but then, when it clicked, wow! What a staggering difference! Both in terms of precision (in following targets and keeping them in the cross-hairs) but also in terms of "natural feeling". And this despite the imperfections of my very primitive test stick (loose on the ground, no thumb buttons, etc.). 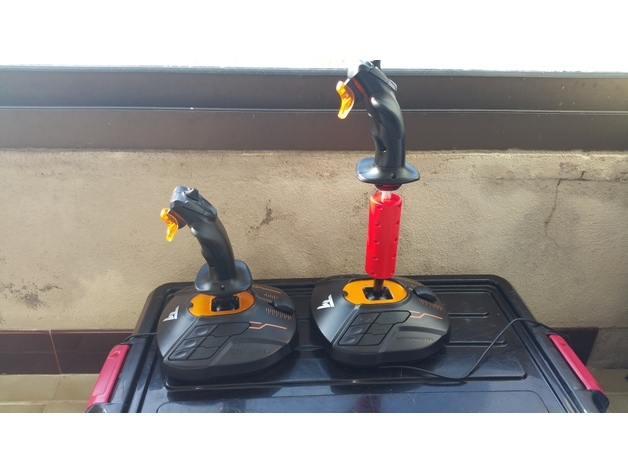 Now I KNOW I absolutely have to find a way to extend my joystick, be it by DIY'ing my current Thrustmaster, or by getting a Warthog with its extension kit, dunno yet. Plus of course figuring the right design for my virtual cockpit, but there are many examples on this forum.